Last month I was getting set up with equipment required to perform sheet metal replacement and repair. 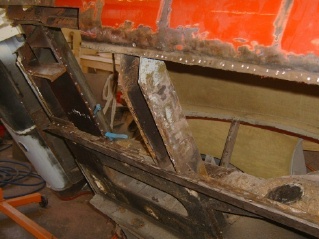 As I continued to remove paint and bondo from the lower area of the E-Type 2+2, I found multiple areas of rust that would require repair. As I mentioned last month, the book I purchased from Amazon entitled “How to Restore Classic Car Bodywork” by Martin Thaddeus gave me ideas and confidence on how to tackle the problem areas. First I went after some of the minor areas of corrosion by cutting out modest size chunks in preparation for the insertion of small repair inserts. An example would be an area just to the right of my license frame, which was pinholed with rust. I cut out a rectangular section and made up a piece of new sheet metal to match the cut out area. I then could tack weld the new piece into place. Once it was stable with tack welds about an inch apart, I could fill in the rest of the spaces in between with weld. Grind the welds down flush and you have a basic patch. Next I decided to tackle the trunk area. The trunk area where the spare tire goes was rusted through. It was also the site of the “bodge” that used a pop riveted repair panel! (See last months article) First had to get the gas tank out. I think when they built the car the gas tank was the first item on the assembly line and the rest of the car was built around it! I don’t know how they got it in there any time after the fact because I had to cut out sheet metal to get it out. My advice is expect to have to cut away the seam that juts into the rear compartment at the license plate area if you need to get your gas tank out. The good news was that the area under the gas tank was totally rust free. I am guessing that the spare tire being put away wet has something to doing with the fact that only one side was corroded. To avoid removal of even more spot welds, I pulled out my air powered cutoff tool and made a straight incision front to rear across the floor of the trunk, separating it into left and right halves. I then worked my way around the perimeter of the remaining seam until the trunk bottom fell out to the floor. This was by far the most intimidating hole that I had ever created in any restoration project. I was committed now. I purchased a new trunk floor from Terrys Jaguar. It had a Martin Robey sticker on it so it was the real item from the UK. I trial fit it numerous times before committing to a final shape and fit. Even with the Martin Robey parts, which are supposedly made from original Jaguar tooling, it is generally accepted that a certain amount of tweaking will be required. Finally, I began to carefully tack weld the piece into position. MIG welding has the advantage that the heat input is minimal compared to other forms of welding. Too much heat will cause your sheet metal to warp and distort. So the trick is to work in short bursts, starting with widely spaced welds and gradually filling in the intervening spaces. 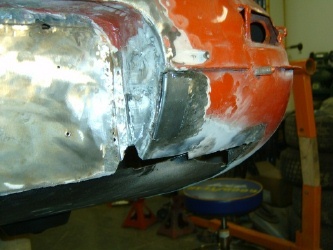 Note that the original spot welds were not continuous but rather were placed on one to two inch spacing. So you can lay in your replacement welds with a similar pattern and be assured of sound structural integrity. A spot weld can be mimicked with a MIG welder by filling in the holes created from drilling out the old welds with new weld material. When done, grind down the weld surface flush and you have a reasonable facsimile of a spot weld. Purchase a hand punch that places holes of the proper size near the edge of the sheet for this purpose. Trying to drill the holes is possible but it always leaves a jagged edge that must be cleaned up with a file or grinder so the punch will make life much simpler. 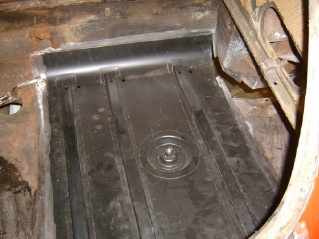 After great effort I had the satisfaction of seeing my trunk floor in place and welded out. Not a complete sub-assembly but rewarding none the less. Next I turned my attention to the passenger side floorboard. The floorboard was not totally rusted but it was too far gone to attempt to salvage with patch panels. Plus the floorboard is one those replacement panels that can be purchased from Martin Robey. I bought a full set of floorboards from Terrys, one for the left side and one for the right side. At least on the 2+2, it appears that the floor sheetmetal is adjoined around it perimeter with overlapping seams that are copiously spot welded. But it is a seam that can logically be separated in preparation for the new piece. I proceeded to first cut out the old floorboard one or two inches inboard of its edge with my grinding disk. This got the bulk of the old floor out of the way, giving me better access to the critical seam. Next came the tedious part, that being the drilling out of dozens of spot welds placed around the perimeter. One trick is to work the seam with your wire wheel, removing the undercoating and paint. The spot weld tends to be slightly depressed below the surface of the metal sheet, such that as you work the wire wheel the spot welds are magically revealed as a circular spot of paint that remains behind. Center punch each spot and have at it with your spot weld cutter. Try and cut through only one of the two thicknesses. After a bunch of welds are drilled, a flat chisel can be inserted between the two plies and when struck smartly with a hammer, each spot weld will give way. Be careful, this “scarf” piece has sharp edges so gloves should be worn. It took me hours to work my way around the perimeter of the floor to remove the remnants of the old floor. After this was done, I attacked the remaining surface with a wire wheel and a grinder to bring it level and make it clean for the subsequent fit-up and welding. What remained was a truly enormous hole in the bottom of the car! BTW, I choose to leave the rectangular box section seen in the picture. This section serves as a seat support. In retrospect, it might have been easier to remove it also or even to form up a new section from scratch. Also at the rear of the floor where it transitions to the bulkhead and rear seat area things get tricky. But if you study it and remove material gradually the puzzle is revealed! Next month, I’ll get new floor sheet metal tacked in and welded out.